Important: We request your email address to ensure that the recipient(s) knows you intended for them to see the email, and that it is not junk mail. Our Cell Meter™ assay kits are a set of tools for monitoring cell viability and proliferation. There are a variety of parameters that can be used for monitoring cell viability and proliferation. In normal cells, DNA density changes depending on whether the cell is growing, dividing, resting, or performing its ordinary functions. The progression of the cell cycle is controlled by a complex interplay among various cell cycle regulators. These regulators activate transcription factors, which bind to DNA and turn on or off the production of proteins that result in cell division. Any misstep in this regulatory cascade causes abnormal cell proliferation which underlies many pathological conditions, such as tumor formation. Potential applications for live-cell studies are in the determination of cellular DNA content and cell cycle distribution for the detection of variations in growth patterns, for monitoring apoptosis, and for evaluating tumor cell behavior and suppressor gene mechanisms. This particular kit is designed to monitor cell cycle progression and proliferation using our proprietary Nuclear Green™ LCS1 in live, permeabilized and fixed cells. The percentage of cells in a given sample that are in G0/G1, S and G2/M phases, as well as the cells in the sub-G1 phase prior to apoptosis can be determined by flow cytometry. Cells stained with Nuclear Green™ CC1 can be monitored with a flow cytometer at Ex/Em = 490 nm/520 nm (FL1 channel). Sorry, your browser does not support inline SVG. Relative Intensity (%) 100 80 60 40 20 0 Sorry, your browser does not support inline SVG. Move mouse over grid to display wavelength & intensity values. This protocol only provides a guideline, and should be modified according to your specific needs. Thaw all the components at room temperature before starting the experiment. For each sample, prepare cells in 0.5 mL of warm medium or buffer of your choice at a density of 5 × 105 to 1 × 106 cells/mL. Note: Each cell line should be evaluated on an individual basis to determine the optimal cell density for apoptosis induction. Treat cells with test compounds for a desired period of time to induce apoptosis or other cell cycle functions. Add 2.5 µL of 200X Nuclear Green™ CCS1 (Component A) into the treated cells. Incubate the cells in a 37°C, 5% CO2 incubator for 30 to 60 minutes. Note: For adherent cells, gently lift the cells with 0.5 mM EDTA to keep the cells intact, and wash the cells once with serum-containing media prior to incubation with Nuclear Green™ CCS1. The appropriate incubation time depends on the individual cell type and cell concentration used. Optimize the incubation time for each experiment. It is not necessary to fix the cells before DNA staining since the Nuclear Green™ CCS1 is cell-permeable. Optional: Centrifuge the cells at 1000 rpm for 4 minutes, and then re-suspend cells in 0.5 mL of assay buffer (Component B) or the buffer of your choice. Monitor the fluorescence intensity using a flow cytometer with FL1 channel (Ex/Em = 490/525 nm). Gate on the cells of interest, excluding debris. DNA profile in growing and nocodazole treated Jurkat cells. Jurkat cells were treated without (A) or with 100 ng/ml Nocodazole (B) in a 37 °C, 5% CO2 incubator for 24 hours, and then dye loaded with Nuclear Green™ CCS1 for 30 minutes. 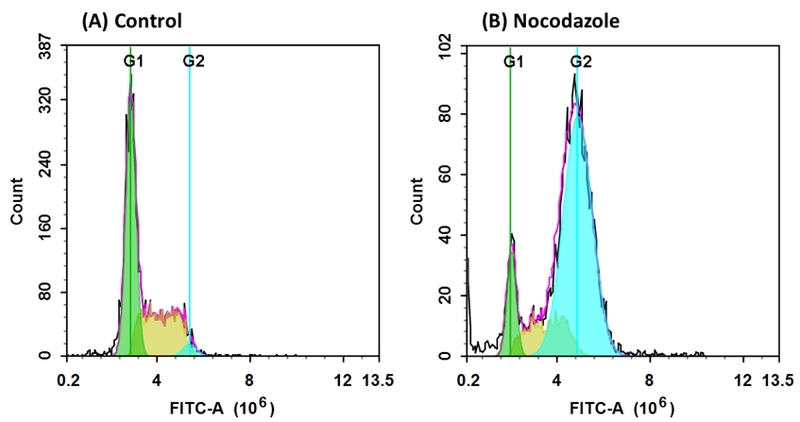 The fluorescence intensity of Nuclear Green™ CCS1 was measured with ACEA NovoCyte flow cytometer with the channel of FITC. In growing Jurkat cells (A), nuclear stained with Nuclear Green™ CCS1 shows G1, S, and G2 phases. In Nocodazole treated G2 arrested cells (B), frequency of G2 cells increased dramatically and G1, S phase frequency decreased significantly. AAT Bioquest provides high-quality reagents and materials for research use only. For proper handling of potentially hazardous chemicals, please consult the Safety Data Sheet (SDS) provided for the product. Chemical analysis and/or reverse engineering of any kit or its components is strictly prohibited without written permission from AAT Bioquest. Please call 408-733-1055 or email info@aatbio.com if you have any questions. Authors: Ferullo DJ, Cooper DL, Moore HR, Lovett ST. Authors: Engstrom JU, Kmiec EB. Authors: Kuo HM, Chang LS, Lin YL, Lu HF, Yang JS, Lee JH, Chung JG. Authors: Louie MC, Revenko AS, Zou JX, Yao J, Chen HW. Authors: Easwaran HP, Leonhardt H, Cardoso MC. Authors: Luna L, Rolseth V, Hildrestrand GA, Otterlei M, Dantzer F, Bjoras M, Seeberg E.
Authors: Essers J, van Cappellen WA, Theil AF, van Drunen E, Jaspers NG, Hoeijmakers JH, Wyman C, Vermeulen W, Kanaar R.
Authors: Conlon KA, Zharkov DO, Berrios M.
Authors: Nunez R, Garay N, Villafane C, Bruno A, Lindgren V.
Authors: Baran-Marszak F, Feuillard J, Najjar I, Le Clorennec C, Bechet JM, Dusanter-Fourt I, Bornkamm GW, Raphael M, Fagard R.